STREETSBORO, OH – Leading the industry in explosion proof material handling equipment for hazardous environments, The David Round Company makes custom explosion proof products that are specially designed to meet electrical standards required for classified manufacturing and processing areas. David Round’s explosion proof equipment is tested and exceeds industry standards. With capacities ranging from 1/4 to 30 tons available, any of David Round’s products that are electrically powered can be built with explosion proof motors and controls. David Round’s explosion proof equipment is most commonly used in the military, pharmaceutical, nuclear plants, oil refineries, chemical and petrochemical plants, wastewater treatment plants, gas power plants and paint shops. Featuring NEMA 7 enclosures, pendants and fittings as well as explosion proof rated motors as required. David Round’s explosion proof hoists and products are intended for H-4 operation in Class I environments with flammable gasses and vapors and Class II locations where combustable dust is present. To further reduce the likelihood of inadvertent sparking during normal lifting operations, all explosion proof hoists and products include spark-resistant features. These include stainless steel construction, stainless steel wire rope (where necessary), stainless steel chain, bottom blocks, hooks, trolleys, jib and floor crane construction where applicable, explosion proof motors, brakes, controls and pendants. David Round is able to manufacture corrosion resistant stainless steel versions of many lifting products. If you have special applications or unusual challenges, our engineering staff welcomes your request to custom design a unique solution to your environment. David Round is flexible enough to accommodate purpose-built lifting equipment and offers a large range of options such as various levels of polished surfaces and explosion proof designs. 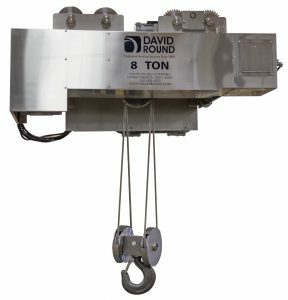 David Round makes explosion proof hoists, winches, jib cranes, floor cranes, tractor drives, jib motorization kits and other David Round products that are electric.